Rose Cottage, Arnside is an ideal base for a family or couples wishing to explore the varied and beautiful landscapes of the southern Lake District and north Lancashire and Yorkshire. It is tastefully furnished with a mix of old and new pieces, and interesting pictures, and with a charming garden and cosy stoves it provides an inviting retreat at any time of year.The cottage and the area are ideal for getting out and about, or for doing not very much at all. They are also perfect for a rendezvous with friends or family further north or south, being a short drive from the M6. Arnside is a coastal village in the delightful Arnside & Silverdale Area of Outstanding Natural Beauty. It is close to the Lake District, but tends to be warmer, drier and sunnier. The cottage is a few minutes’ walk uphill from the promenade, which is lined with cafes, pubs and shops and has lovely views across the estuary. There are walks from the door and attractions close by. The Lake District and the Yorkshire Dales are both easily accessible via scenic drives, as are the lesser known beautiful areas such as the Forest of Bowland and the North Pennines. 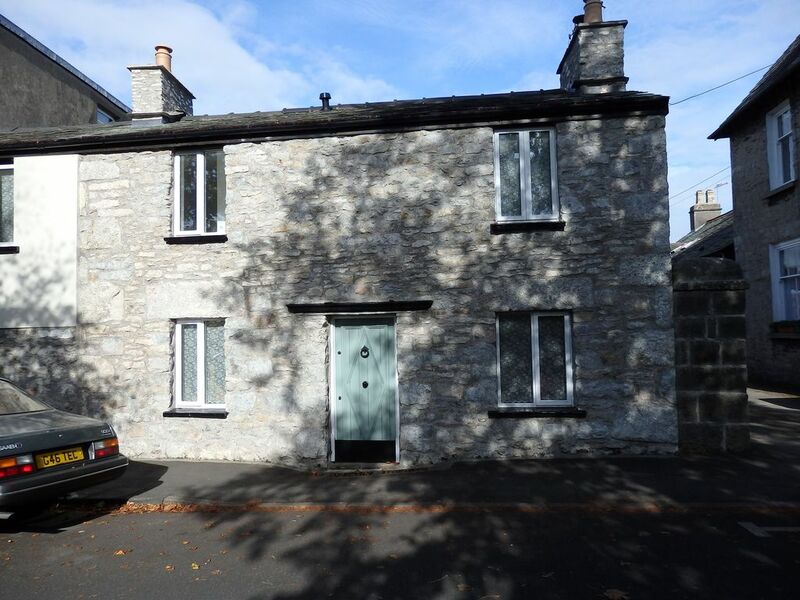 Rose Cottage has been created by linking a traditional stone and slate cottage with its adjoining stables. It is comfortable, practical and flexible. The downstairs living space can be open plan or divided, as desired, and the bedrooms can accommodate an extended family but also provide private space for two or more couples. Family room, in the old cottage, with a stone floor, wood burning stove, fireside chairs, dining table, and stairs to the double and bunk rooms. Archway to the light and airy kitchen, which has a built-in breakfast bar separating the kitchen and sitting room, and a stable door to the garden. Large sitting room in the old stables, with wooden floor, seating for 6, gas stove, large TV and DVD player, French doors to the courtyard garden, door to master bedroom suite, and stairs to attic bedroom. Utility room with separate WC, hand basin, washer-dryer, large sink, freezer, coat and boot space, drying rails and a door to the side passage. Master double bedroom with super king size bed (can be made into twin beds on request), views over the courtyard garden, dressing room and en-suite bathroom. First floor: attic bedroom with king size bed, sitting area and en-suite shower room. Outside, there is a charming, secure courtyard garden with a table and chairs for 6, and access to the side gate onto the street. Also, a larger garden with more seats, and some views to the estuary. Maximum occupancy of 6 adults plus 2 children and 1 infant. Not suitable for 8 adults. Small supermarket 2 minutes’ and nearest pub 5 minutes’ walk. There is comprehensive practical information in a folder in the cottage, but here are some points it might be useful to know about well in advance. The cottage has been created from two buildings, in an L-shape running back from the front, and there are two staircases. The double and the bunk rooms are up one staircase in the old cottage at the front of the building. The attic bedroom with the king size bed is up the stairs from the sitting room, about half way back. The superking/twin room is on the ground floor, right at the back. This layout is perfect for many guests, but may not suit all. There are armchairs and a sofa for 6 adults in the sitting room, additional wooden and wicker chairs in the family room, and also footstools that can be used as informal seating. The breakfast bar is set into the thickness of the wall between the kitchen and the sitting room. Because of the difference in floor level it can take chairs dining chairs on the sitting room side and bar stools on the kitchen side. There are a variety of chairs and stools available to suit the size of whoever is using it. Kitchen: washing up liquid, dishwasher tablets, kitchen roll, hand wash, cleaning materials, tea towels etc, and some catering basics – see the notes under 'pantry items'. We audit and tidy the food cupboards regularly but do not clear them completely after guests leave if there are items which others may find useful. There are local OS maps, plus local walk books, lots of tourist information leaflets and suggestions for a variety of things to do, with or without children, without a car, or on wet days. Very local attractions include the RSPB visitor centre and reserve at Leighton Moss, the National Trust's Arnside Knott (just up the hill) and other sites, train rides round Morecambe Bay towards Barrow, the house and garden at Levens Hall, Leighton Hall. There are lovely local walks along the coast, over hills and through fields and woodland, that can be easy or strenuous, as you wish, with ever-changing views. The sunsets are justifiably famous. There is a small supermarket just up the hill, with plenty of fresh produce as well as basics. It also has a cash machine. Opening hours are 8-8 every day. There is a Booths 10 minutes’ drive away in Milnthorpe and other supermarkets (e.g. Sainsbury, Asda and Tesco) will deliver. There is a larger Booths and an Aldi in Carnforth (20 minutes' drive). Other shops, services and the pubs are down the hill on the promenade. We provide detailed directions for how to get to the cottage and access the keys, plus other useful notes. 'Loved the cottage. The layout is fantastic; quality of décor beautiful, and it is so well stocked. Bedrooms are amazing! 'The cottage feels luxurious: it's light and airy, well designed and very comfortable. Lots of space, indoors and outdoors. 'The cottage is absolutely beautiful! The pictures don’t do it justice really. It is much larger than the pictures suggest. It was fabulous for our family. We were over the moon with the facilities. Thank you. The area (sadly) is new to us. But, boy, have we loved it! 'Amazing, you have thought of everything. Wow,wow, wow! 'Liked the layout, great location and lovely garden. Lovely scenery and good pubs. Close to the Lake District. 'The cottage is in a great position to access the Lakes area. It has everything you could need (perfectly equipped)...It is an amazing cottage, beautifully done. The area is new to us, great for an after dinner walk, has everything you need on your doorstep. 'It is immaculate and furnished with anything we could have wanted. Having wifi was a lovely touch..We would love to stay again...Beautiful scenery, love the prom and the lovely friendly people'. 'Well what can we say - what a fantastic cottage! ...We especially liked the underfloor heating and high quality finish and decor. The kitchen was very well equipped and we were short of nothing. All the other rooms also had nice touches ...The garden was superb. 'The cottage is great for our needs - we are a family of 7 from 1 year old to 78 years. Space for everyone and plenty of areas to sit in. The garden is lovely and the kitchen has everything and more in it. 'Never stayed anywhere so well equipped. Standard of cottage is lovely. 'Really pleasantly and tastefully furnished to a high standard, and very well equipped. A good selection of books and magazines. Lovely comfortable beds. Must be one of the best cottages we have stayed in. Beautiful wild flower beds. There are three bathrooms, and a downstairs WC. Downstairs bedroom has its own en-suite bathroom: shower bath with built-in seat and shower screen, wash basin, WC, plenty of counter and cupboard space, chair. Underfloor heating and Winter/summer function on towel warmer, so towels can dry even if heating is not on. Attic en-suite shower room. Shower with seat, washbasin, WC, plenty of counter and shelf space, chair. Radiator with winter/summer function. Family bathroom (at front) shared between double and bunk rooms. Shower bath with shower screen and built in seat, WC, washbasin, cupboard and counter space. Radiator with winter/summer function and additional drying rail. Downstairs WC. Accessed from utility room. WC, washbasin and cupboard space and counter. Mobile reception is not always good in the cottage, because the old stone walls are so thick, so there is a landline provided, with local calls free. Honesty box for non-local calls. Underfloor heating downstairs, with 6 adjustable zones. Radiator heating upstairs, and in downstairs bathroom and utility. All bathroom and utility radiators can be heated even if main heating is off. Egyptian cotton sheets and pillowcases, except for fitted sheets in bunk room, which are polycotton. Duvets and pillows are non-allergenic. Soft and firmer pillows for each guest. 3 main bedrooms: hand towel, bath towel and bath sheet per guest. Bunk room: hand towel and bath towel per guest. Colours are co-ordinated but different, so guests can know which is theirs. Wood burner in family room. We provide fuel, kindling, matches, newspaper, firelighters, fire irons, a brush and shovel, ashpans, fireguards, protective gloves, and instructions for the wood burner. Sitting room: sofa and armchairs for 6. Plenty of side tables and reading lights, free standing gas stove. Family room: dining table and chairs for 6, 3 portable armchairs, wood burning stove. Full size built-in dishwasher. Quick user guide provided, as well as full instructions and dishwasher tablets. Large induction hob on the range cooker. We have written a quick guide to using it, for those not used to induction (though it's easy to get used to). Three electric ovens of different sizes and sorts, with multiple functions. Quick guide to them provided, as well as the full instruction manual. As minimum: cooking salt, salt and pepper mills, olive oil, vegetable oil, sugar, tea bags, instant coffee, cling film, foil, greaseproof paper, kitchen roll, dishwasher tablets, washing up liquid. Plenty of cooking utensils, pots, pans, bowls, cooking and serving dishes, etc. Many guests have commented on how well equipped the kitchen is. Plenty of glasses and china (formal and informal). Further 100' (30m) walled garden. Lawn, borders, raised beds. Some views towards the estuary and fells beyond. Two sitting areas, some wooden sun loungers and small dining table and chairs for 2. Secure, private courtyard garden, accessed from kitchen and sitting room with dining table and chairs for 6. Sun umbrella provided in summer. Also accessible via lockable side gate from the street. Although there is a downstairs bedroom, the cottage is not suitable for anyone who cannot manage steps at all. The entrance from the front door into the family room is flat but there is a step up from the family room at the front of the cottage into the sitting room, and a few steps up to the dining area in the courtyard. The shower bath in the downstairs en-suite bathroom has a grab rail and a built-in seat, but you need to be able to step into it. Beautiful cottage with everything you could need and more! Our Christmas stay at this cottage was perfect! The cottage itself is beautifully appointed and feels incredibly cosy, whilst also having plenty of space, modern appliances, under floor heating and new bathrooms. Rowena was very helpful before and after check in, and the cottage had been decorated for Christmas, which made it instantly feel like home for the whole family. The kitchen is large and very well equipped. It had everything we needed to make a Christmas lunch. Arnside itself is very pretty and quiet, with some lovely shops and galleries and friendly locals. I can't recommend this cottage enough for a perfect home away from home. I don’t usually write reviews but my family and I have just had a wonderful weeks break at Rose cottage and it deserves a very positive mention. From the gracious hosts and excellent communication to the lovely setup - enough space to be private yet enough common area for board games, meals etc. Everything you might need and everything so well thought out. We were sad to go and definitely look forward to returning soon! High quality throughout. The house is light, fresh and extremely well laid out. The furniture, fixtures and fittings make the house feel lived in. We loved the location and charm of this deceptively large house. It's perfect for large families or friends because of the space to get away from one another! We will be back and recommending this to anyone who'll listen. Views out over the estuary from the garden with a great short walk to the knott for a spectacular sunset. Well appointed and eminently usable house, delightful secret garden, very good kitchen. The only thing to top that was how friendly and helpful the landlady, Rowena, was. Thank you! Enquiries and booking requests in late December 2018 and early January 2019: For a variety of reasons, we will not be able to deal with enquiries and booking requests via HA during this period,and will not be able to update the calendar. We are expecting to be able to do so, and to catch up with any backlog around 10 Jan. We will deal with any booking requests in the order in which we receive them. Thank you for your understanding. Changeover Days: Usually Friday for 7 nights Usually Friday or Monday for short breaks, when available. But we may be able to be flexible. Arrival time is 3 pm Departure time is 10.am Short breaks: Our standard short breaks are Friday - Monday (3 nights) and Monday - Friday (4 nights). They are usually available outside the peak holiday periods. For non-standard short breaks, for short breaks in peak periods or for late availability breaks or low occupancy rates, please contact us. We may be able to be flexible, especially if you are looking to book at short notice. The standard short break prices are set out below. Weekly Rate Friday –Monday (3 nights) Monday-Friday (4 nights) £725 £580 £580 £680 £544 £544 £575 £460 £460 £488 £388 £388 Maximum occupancy is 6 adults plus 2 children and an infant. The cottage is not suitable for 8 adults. Our policies on non-smoking, no pets and maximum occupancy are strict. Guests will be required tio leave or not admitted if they are in breach of them.